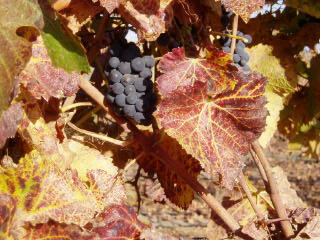 We hit the road on October 28, and by November 1, all of the Pinot Noir had been picked throughout California. It remains a very beautiful time to visit the wine country, for the vineyards take on a kaleidoscope of yellows, reds, and oranges and the few lonely clusters of second growth grapes hang tenuously to life. Our first stop was Cambria in the Central Coast. On the way, we slipped into Fiddlehead Cellars in the Lompoc “wine ghetto” to pick up some fortification for the long trip. It is always a treat to talk wine with Kathy Joseph. Besides Pinot, we picked up some “Sweetie,” the dessert wine she makes from Sauvignon Blanc and a touch of Muscat. This is the perfect wine (and so aptly named) for Valentine’s Day. In Cambria, we stayed at the venerable Blue Bird Inn on Main St,, walking distance to two very fine restaurants I recommend: Robin’s and the Sow’s Ear. Both have excellent wine lists and wine service. It was here we began a scientific study that was never really completed. One of our travelers claimed that after you empty a bottle, you can lay it on its side for a few minutes, and still get ten more drops of wine out. Well we immediately challenged this supposition and spent the entire trip testing each bottle to verify this theory. I know the wait staffs thought we were all loony as we discouraged them from removing the supine bottles from our table until we had tested them. Someone actually kept a count and the same person was assigned to be the counter (she was given the title, “The Countess”). The results are a bit vague in my memory (most testing was done at the end of the meals), but the average was at least 10 drops and probably a few more. One wine we drank in Cambria did stand out in my memory for excellence: 2004 Littorai Les Larmes Anderson Valley Pinot Noir. 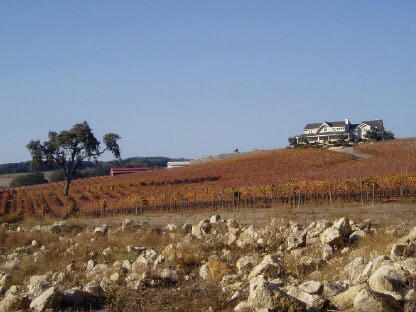 When you hear Paso Robles wine country, you think Zinfandel and Rhone varietals. But, the York Mountain area lies west in the Templeton Gap where maritime influence reaches far enough inland to produce cool microclimates and creates an ideal growing region for Pinot Noir. Foggy mornings, warm days and cooling afternoon breezes suit Pinot Noir just fine. Adelaida Cellars and its historic HMR Vineyard (planted in the early 1960s), and Windward Vineyard have produced some very credible Pinot Noirs from this region. Still others, including Bianchi Vineyards, Casa De Caballos Vineyards, Wild Horse Winery & Vineyards, and York Mountain Winery, have made Pinot Noir fanciers take note. The latest kid on the block is Jack Creek Cellars. You won’t meet another couple who are more passionate about Pinot Noir than Doug and Sabrina Krause. Doug is a burly, lumberjack-like figure with a soft spot for Pinot Noir. He was in the grain feed business in Southern California and acquired enough financial resources to start his own winery. He sold his business and bought the front 75 acres of JRK Ranch located in Templeton, 7 miles inland from the Pacific Ocean. The site is located at the southern end of the Santa Lucia Mountain Range. 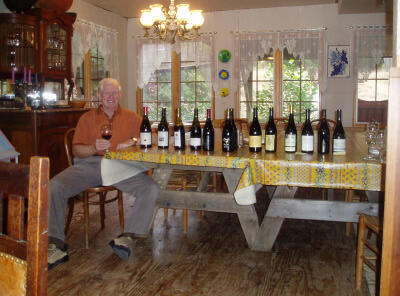 In 1997, he planted 20 acres to Pinot Noir (115, 2A, Pommard), 4 acres to Chardonnay, and a little to Syrah. Recently, he has planted more Pinot Noir (Dijon 828 and 943) and more Syrah and Grenache. The photo shows the new plantings from the winery’s pad. The layout at Jack Creek Cellars and the Kruse Vineyard is dreamy. The gorgeous home sits on the top of the hill surrounded by vineyards and the modern winery and adjacent storage barn is tastefully positioned among the vineyards as well. Inside the winery, Doug has a comfy couch and a large TV (tuned to an NFL game on the day we visited). Doug and Sabrina are totally immersed in their new lifestyle and eagerly travel the country to sell their wines. Of course, it doesn’t hurt that they have to service major accounts in Hawaii, Chicago and Scottsdale. Currently they produce about 1500 cases, primarily Pinot Noir with a little Chardonnay and Syrah. Eventually, they plan to reach 2500-3000 cases. They also sell some of their grapes to notable producers like Tony Craig at Sonnet Wines. Doug is not shy in admitting he prefers a bigger style of Pinot Noir. He produces two Pinot Noirs: an estate bottling that is more traditional for California and a reserve bottle that is fat and opulent. He says that his customers are split - about half preferring the regular bottling and half relishing the reserve bottling. We tasted through his latest releases and also did some barrel tasting from the 2005 vintage of individual clones in both neutral and new oak. The winery and my three drinking partners on the trip are pictured. 14.5% alc., $32. · A medium-bodied wine with a warm robe of dark violet. The nose is substantial with notes of dark cherries and licorice. With air time the wine becomes really plush on the palate - as smooth as a baby’s bottom. The finish lingers with black raspberry, oak and fine dusty tannins. A wine that really reflects the terroir of this vineyard. 14.7% alc., $42. · Everything is ramped up here. The color is dark. The nose is a bit closed at this point with buttery toast and earth notes and a hint of alcohol. This is a rich, full-bodied wine with mountainous fruit, especially plum flavors. There is a solid backbone of oak and tannins that works in harmony with the fruit. The finish is pure and clean. A Big Gulp for lovers of hardy Cali Pinot Noir. Jack Creek Cellars is located at 5265 Jack Creek Road, Templeton, CA (just off Hwy 46, a short drive from Hwy 1 or Hwy 101). Tasting by appointment. The phone is 805-226-8283. Wine may be ordered on the website: www.jackcreekcellars.com. The Syrah is one big fruit bomb and deserves attention for those with a Rhone bent. 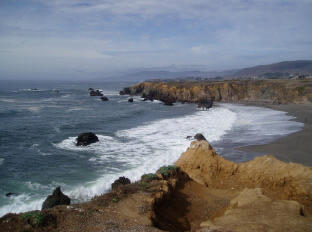 The second leg of our journey took us to Half Moon Bay on the coast, 30 miles south of San Francisco. We stopped on the way in the Santa Cruz Mountains to visit good friends Dave and Anne Mouton and Laura Ness at Burrell School Winery. Just a mile from the winery is a terrific gourmet food store, the Summit Market, where we loaded up on picnic rations and sat out on the tasting room deck (photo right) at Burrell School overlooking the vineyard on a glorious sunny day. I have detailed the history of this winery in previous issues of the PinotFile. Dave and Anne Moulton bought an 1890 one-room schoolhouse on Summit Road at 1600 feet elevation in the Santa Cruz Mountains. They restored the schoolhouse and built their own living quarters adjacent. The original schoolhouse was used as a tasting room for a number of years, but it now has become the Moulton’s living room with the recent opening of a new tasting room. The tasting room is a very classy place to enjoy one of the many excellent wines made here. 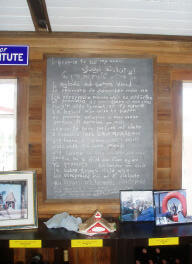 On a blackboard behind the tasting bar is written the winery’s motto, “I Promise to Sip My Wine,” in many different languages. 14.6% alc., 700 cases, $38. The Veranda Vineyard is at the southern end of the Santa Cruz Mountains. It is planted to a mixture of Dijon clones. Aging is in 70% new French oak. · A dark and rich Pinot that packs plenty of punch. The nose is appealing with multiple Pinot fruits evident enhanced by floral notes. It is a balanced wine on the palate showing strawberries, rhubarb, spice and mushrooms. The generous oak tannins are nicely immersed. A well-schooled Pinot. 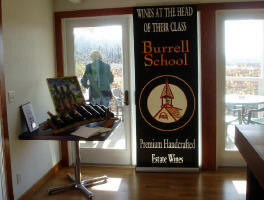 Burrell School Vineyards & Winery is located at 24060 Summit Rd, Los Gatos, CA 95033. The phone is 408-353-6290. 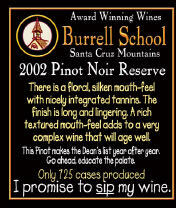 Wines may be ordered on the website at www.burrellschool.com. The tasting room is open Thursday through Sunday, 11:00 to 5:00 and by appointment. Laura Ness, who assists the Moultons with the operation of the winery, writes about the Santa Cruz Mountains wine scene for Appellation America and is an organizer of Pinot Paradise, March 24 and 25, 2007. For more information on Santa Cruz Mountains Pinot Noir, go to www.scmwa.com. Santa Cruz Mountains has its own Pinot Noir Wine Club, offering periodic shipment of a variety of Santa Cruz Mountains boutique Pinot Noirs (www.SantaCruzWineClub.com). 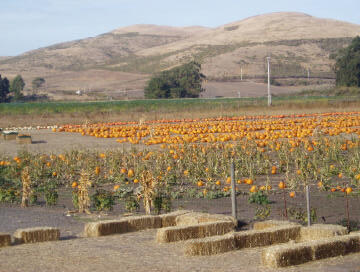 Half Moon Bay is the “Pumpkin Capital” of California with multiple pumpkin growers and an annual pumpkin festival. The one street town has plenty of boutiques that can keep women happy for hours. By now our cars were bulging with pumpkins and various “deals” our wives accumulated, not to mention the multiple boxes of wine we were acquiring along the way. It was now off to the Russian River Valley, but not before stopping in Marin County to visit Mark and Myriam Pasternak at their Devil’s Gulch Ranch in Nicasio. Mark is a city boy (grew up in Southern California) who knew early on he wanted to be a farmer. He purchased Devil’s Gulch Ranch in the 1970s, built his own ranch house residence, and stocked the farm with rabbits (he raises them for Bay Area restaurants), pigs, horses, and various other livestock. This 75-acre diversified working ranch is a 45 minute drive north of San Francisco and is located in and surrounded by the pristine Golden Gate National Recreation Area. In 1980, Mark planted a few acres of Pinot Noir (Martini clone) and Chardonnay and sent the grapes to Schramsberg and Kalin Cellars to be used for sparkling wine. By 1991, he realized the grapes were good enough quality to make still Pinot Noir. Currently, his 20 acres of grapes still supply Schramsberg but are also sold for vineyard designate Pinot Noirs by Dutton-Goldfield and Sean Thackery. Over the years, Mark has become a highly-respected grape farmer and now farms or consults on practically every acre of Pinot Noir in Marin County (about 80 acres at present). His reputation may eventually overtake the much-beloved Grateful Dead in Marin County. Mark cooked some of his delicious rabbit and we sat down to lunch with a lineup of practically every current Pinot Noir release in Marin County. The wines varied considerably in structure and taste, but they all had in common the wild and concentrated flavors and lively acidity for which Marin County is known. I felt like a kid in a candy store. Marin County Pinot Noirs are made in small quantities and hard to find, but the search is worth the trouble. 14.1% alc. · An excellent Pinot with bright fruit and perfect balance. 13.5% alc. · A very elegant and mellow wine with an appealing velvety texture. A good argument against the adage that California Pinots can’t age. 13.6% alc. · A plush, fruitdriven wine with all kinds of flavors going on. Put this one away for a year or two and you will be smiling. 15.2% alc.. · A very unique style that has the imprint of winemaker Thackrey. Plenty to like here and the alcohol is fully integrated. 13.9% alc. · Both wines are made in a finesse style with a lot of charm. Good food Pinots. 14.1% alc. · This wine is from three vineyards in Marin County. It is closed at the moment and needs decanting with several hours of air time to show its fruit. A perennial favorite of mine. 13.7% alc. · Lighter Styled with appealing red fruits. 14.7% alc. · An excellent Pinot Noir with everything working in harmony. One of my favorites. After lunch, Mark took us for a tour including his swimming hole. Every summer he runs the Devil's Gulch Ranch Summer Day Camp for kids 6-17 who have the opportunity to work with the animals and in the gardens, learn skills and crafts from the past, climb, hike, and swim and explore the neighboring Samuel P. Taylor State Park. Visit www.devilsgulchranch.com for details. The phone number is 415-662-1099. 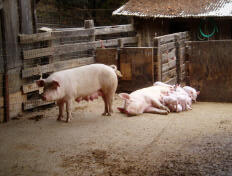 I can’t imagine a better way for city kids to experience farm life. 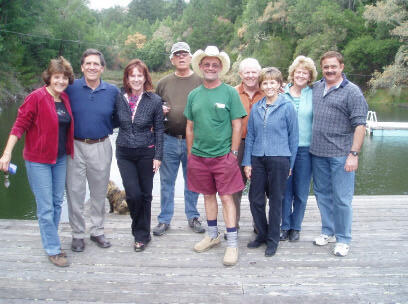 Below is the Crew at the swimming hole with Mark in the center. The end of our journey was the Russian River Valley and a home on the River a couple of miles from Healdsburg. The rental, Firefly Lodge, was a modern home with four bedrooms, a fully-equipped gourmet kitchen, and expansive decks that looked out on a serene river view. 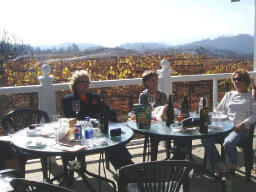 Wine Country Lodges (www.winecountrylodges.com) has several properties for small and larger groups in the area and I highly recommend them. The home was so comfortable, we ended up cooking dinner there two nights. Memorable wines included 2000 Domaine Serene Marc Bradford Willamette Valley Pinot Noir, 1998 Vincent Girardin Grands Echezeaux, 2003 WH Smith Maritime Vineyard Sonoma Coast Pinot Noir, 2002 Robert Stemmler Nugent Vineyard Russian River Valley Pinot Noir, and 2005 Miner Rosato (magnum). 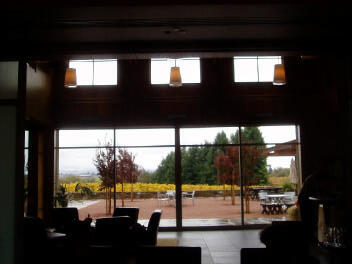 It was a rainy day when we arrived at Lynmar Winery on Frei Road in Sebastopol. The setting couldn’t have been more inviting. The winery’s new hospitality center has vistas of the Russian River Valley and surrounding vineyards from every viewpoint. The inside is very serene and relaxing. We had a marvelous lunch cooked by the Lynmar resident executive chef, Sandra Simile, accompanied by and perfectly matched with Lynmar wines. 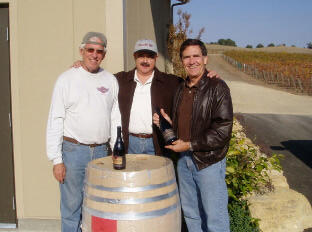 Lynmar has been a reputable producer of Pinot Noir in the Russian River Valley for many years. Recently the winery underwent a complete renovation with new caves and the construction of a tasteful hospitality center. The wines have always been good, but now seem even more refined under the direction of winemaker Hugh Chapelle (formerly Flowers), and consulting winemaker Paul Hobbs. 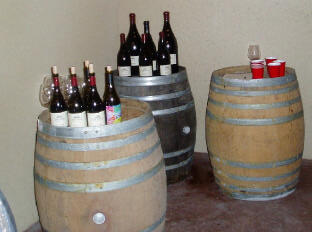 At present, they offer two Pinot Noirs: a Russian River Valley blend, and the estate Quail Hill Vineyard designate. Hugh Chapelle told us they are planning to add a number of single vineyard Pinot Noirs to their portfolio in the coming years. 14.1% alc., 474 cases, $24. This is the third vintage of Vin Gris sourced from several vineyards in the Russian River AVA including the Quail Hill Vineyard. It is composed of 92% Pinot Noir and 8% Syrah. The winemaking employed two methods: (1) the saignée method was used to bleed some Pinot Noir and Syrah juice soon after destemming and processed like Chardonnay (except fermented in neutral oak barrels) and (2) 40% of the wine came from fruit grown specifically for the rosé program, processed as usual for Pinot Noir and aged in stainless and neutral barrels. · The wine is the finest example of Vin Gris I have ever drunk. Bright, fresh and crisp, but with plenty of aromas and flavors to keep your attention, it is the perfect aperitif wine. Watermelon and spice and everything nice. The winery is currently offering their Vin Gris for $18 as a promotion for the holidays. A steal. 14.2% alc., 4520 cases, $30. Here you have the best of both worlds. 60% of the grapes are vinified in stainless steel tanks to retain crisp acidity and 40% is transferred to French oak barrels. 100% of the wine undergoes malolactic fermentation. This is a Russian River blend of grapes from several vineyards. It was paired at lunch with brown clamshell mushroom soup. · This is a very classy Chardonnay with plenty of palate-cleansing acidity, but yet a complex of flavors including tropical fruits and fresh bread with a hint of butter and toast from the MLF and oak. The pairing was magical. (Note: all recipes are on the winery’s website). 14.4% alc., 2674 cases, $36. Several select vineyards and Lynmar’s 42-acre Quail Hill Vineyard supply the fruit for this wine. Winemaking was traditional for California Pinot Noir (picked cold, de-stemmed, open-top fermenters, cold-soak, punch downs, MLF in barrel, aging on light lees, aging in French oak barrels, 30% new for 16 mo). A wonderful example of the new classy and refined style of Lynmar Pinot Noir. This was matched with sautéed boneless breast of Rocky chicken with Pinot Noir sauce, grilled vegetables, and rosemary roasted potatoes. · This Pinot is a terrific food wine. The aromatics feature ripe berries, cherries and herbs. There is the signature Russian River cola and spice in the background. Sleek and balanced with plenty of style and grace, the wine finishes with spice and vim. 14.4% alc., 976 cases, $50. This wine is composed from the finest barrels from the best vineyard blocks in each vintage. There is plenty of Swan selection grapes in the final mix, along with Dijon clones playing a supporting role. The wine is aged 18 months in 40% new French oak barrels. Tasted at home. · This is a Pinot Noir of great breeding - a thoroughbred. It is a big, plush wine that, like all great wines, keeps getting better and better in the glass with air time. It is sophisticated, complex and balanced. There is more earthiness, mushrooms and minerality than in the above Pinot Noir. The texture is velveteen. This is a serious wine with years of bottle development ahead of it and I recommend cellaring it. Lynmar Winery is located at 3909 Frei Road, Sebastopol, CA 95472. The phone number is 707-829- 3374 (Ext 113 for ordering). The website is www.lynmarwinery.com. The Lynmar Experience, a pairing of food with Lynmar wines is available Friday-Monday, 11:00-4:00. Lynmar wines enjoy a wide retail distribution as well. 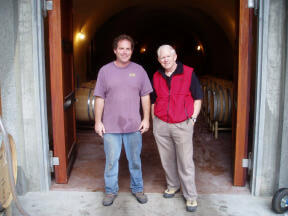 Bob Pellegrini is one of the wine patriarchs of the Russian River Valley. He has been involved with wine in one way or another his entire life and he can weave many fascinating tales about the wine business both during and after Prohibition. He talked to us about the days of Prohibition in San Francisco when grapes were delivered to markets and everyone in town (at least the Italians) had a small winery in their basement. 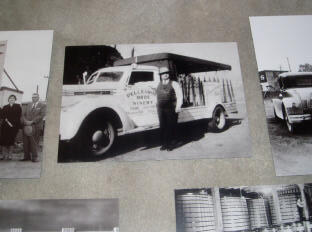 He proudly displays photos of his family and their wine business on the wall of his tasting room. Bob was fresh out of school and had taken a tour of Burgundy when he had the crazy idea of planting Pinot Noir on Olivet Road in the Russian River Valley. At the time, Pinot Noir vineyards were far and few between (Joe Rochioli first planted his East Block Pinot Noir in 1968). He started the Olivet Lane Vineyard in 1972 with the only Chardonnay and Pinot Noir vines available at the time and never looked back. Fortunately, he had a wine import business which kept him afloat as he developed his winegrowing business. He says today he was just naïve enough at the time to think it would work, but if he knew then what he knows today, he would have never done it. The Olivet Lane Vineyard is now one of California’s cherished heritage vineyards and continues to thrive on rootstock vulnerable to phylloxera. The group tasted through Bob’s current Olivet Lane Pinot Noir releases as well as the Hamel Sonoma Coast Pinot Noirs made by Pellegrini Family winemaker Kevin Hamel. Bob (on the left, Kevin to the right) looks rather serious in this photo, but I assure you that Bob has a great sense of humor. $30 Kevin loves working with Olivet Lane fruit for he says the wine makes itself; no tricks, additives, modifications required. 10% whole clusters used. Aged 11 months in French and Eastern European oak, 33% new. · This has been in bottle only a short time so will only get better. Still, it is pretty flashy already, with aromas of earth, leather, and spiced black cherries. This is a Pinot that has finesse over fruit heaviness and great verve and style. It is a little showier than the 2004. So juicy and tasty you want to ‘nibble’ at it. 14.6% alc., 553 cases, $28 · The seductive nose has blackberries, exotic woods, a little leather and chocolate. It is soft and silky on the palate. The coating tannins are well-integrated. Pure pleasure. 14.6% alc., 568 cases, $28 This is from a vintage that was very warm at the start of harvest. The result was a powerful and structured wine. · Last time I tasted it earlier this year it was still a debutante waiting to come out. Now it is the belle of the ball. This Pinot is a cherries jubilee and my wife actually got excited about this one. She insisted I buy some and put it aside in a corner of my cellar just for her. Patty’s pick of the litter. 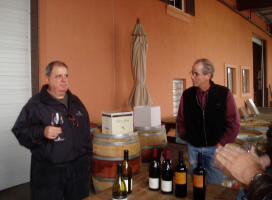 Pellegrini Family Vineyards is located at 4055 W Olivet Road, Santa Rosa, CA 95404. 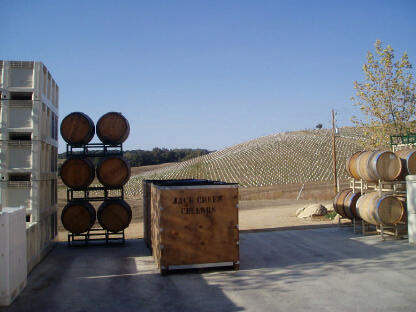 The tasting room is positioned next to barrel storage in the winery and very charming. It is open daily. The phone is 707-545-8680. The website is www.pellegrinivineyards.com. Pellegrini was featured in the PinotFile, Volume 5, Issue 22. 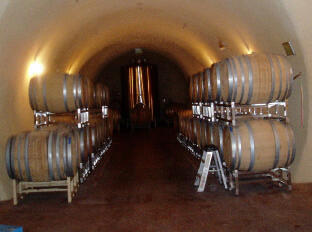 The winery produces several other varietals which are also high quality including Chardonnay, Zinfandel and Carignan. Hamel Wines are sold through retail distribution (for example, the Wine Club in Santa Ana, CA, www.thewineclub.com). The phone number is 707-433-9055.
this facility was smaller and much less attractive and was the place where Williams Selyem made some of their first wines in 1986-1987. Up until last year, Kosta Browne leased space in this facility from Ken Freeman (they have since moved to Deerfield Ranch in Sonoma Valley). Freeman Cellars owners Ken and Akiko Freeman have spent their investment so far on much-needed wine-making equipment and technology and upgrading the facility. The cosmetic improvements are secondary at this point and are yet to come. We tasted with Ed in a corner of the caves (above right). University of Massachusetts. He worked in a wine shop at the time and later moved to California to sell wine in the Bay Area. He quickly realized that he would rather make wine then sell it and went to Fresno State to obtain his degree in enology. His 16 years of winemaking experience include four harvests each at Bernardus, Chalone, Testerossa, and Freeman Cellars. Ed says that 2005 was a perfect growing year for Pinot Noir, “THE Pinot year.” 2006, in contrast, was “The botrytis year,” which required special efforts in the vineyard and careful sorting in the winery after harvest. The 2005 Freeman Pinot Noirs have around 14% alcohol, lower than in the 2004 vintage. The 2004 Sonoma Coast wines were bigger and richer than the Russian River wines; in 2005 the roles were reversed, the Russian River wines being plumper. Generally the wines see about 40-45% new French oak from five different coopers. All of the wines were tasted briefly and I came away with the general impression of consistency in style here with complex aromas and flavors, an unctuousness on the palate, finishes which leave a lasting impression, and all elements in proper harmony. Because they are so young and only recently bottled (you might call this infanticide), they are shy and reserved, but there is no mistaking their potential for greatness. Freeman Vineyards & Winery is located at 1300 Montgomery Road, Sebastopol, CA, 95471. The winery is not open to the public. Pinot Noirs are sold primarily through a mailing list and to restaurants. Production was 2200 cases in 2004 and about 3000 cases in 2005. The phone is 415-831-4756. Sign up for the mailing list at www.freemanwinery.com. 406 cases · This Pinot is still closed from recent bottling. We took it to lunch and over time it began to blossom and strut out some unctuous Pinot flavors. 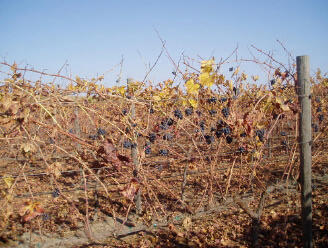 It is similar to the Freeman wines, but with a little more dark fruits and structure typical of this vineyard. The 2004 vintage of this wine was a knock-out and this one should follow in step when ready to drink. 118 cases · This is a flamboyant sucker with opulent fruit that jumps out of the glass and floods the mouth. It is fat on the palate and enhanced with deft wood and brown spice. Despite its prodigious fruit, there is ample acidity to balance everything out. 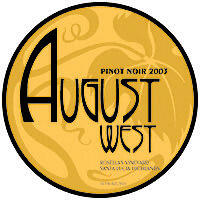 August West wines are available at fine restaurants and retail markets. There is a mailing list signup at www.augustwestwine.com. Prices hover around $50. 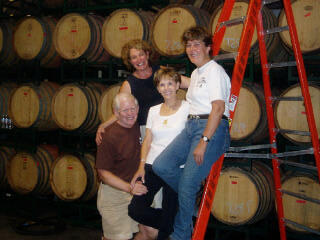 The winery’s address is 1300 Montgomery Rd, Ste 2, Sebastopol, CA, 95472. The phone is 415-225-2891. Ed is also producing a small amount (120 cases) of Sandler (his middle name) Syrah from a cool vineyard in the Bennett Valley region of Santa Rosa. His model for this wine is the French producer, Guigal, and he patterns his winemaking after Guigal. He uses 100% whole cluster, striving for the aromatics, tannins, and structure of Guigal Syrahs. A very impressive wine that will surely become a cult favorite among Syrah fanciers. Ed will be selling it soon when he acquires a resale license. On the last day of the trip, the Crew motored out to the Sonoma Coast. We picked up rations at the Fiesta Market in Sebastopol and the Wild Flour Bakery in Freestone. If you like great bread, and who doesn’t, Wild Flour is an oasis in the tiny town of Freestone. Wild Flour bread is made in a wood-fired brick oven with organic ingredients and just may be the best bread on the planet. The artisan loafs are baked each morning from Friday thru Monday and are often sold out by noon. Owner Jed Wallach is out front, offering bite-sized samples of each of his creations. 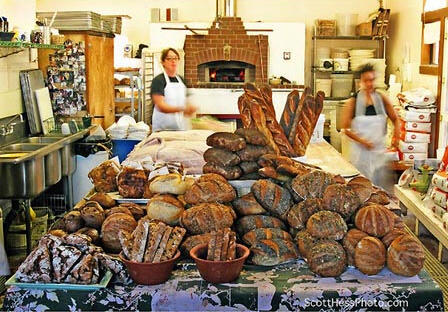 The San Francisco Chronicle wrote: “Day trippers from all over the Bay Area drive to Freestone to sample Wallach’s creations.” The bakery is located 5 miles west of Sebastopol at 140 Bohemian Highway. 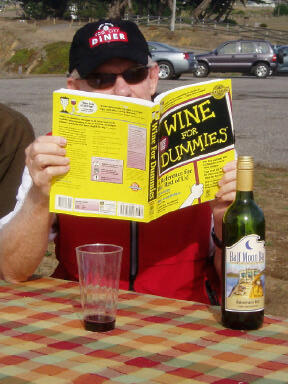 I leave you with a parting image: the Prince sitting at the picnic table, catching up on his reading and finishing a bottle of Half Moon Bay Red in a plastic cup. Life is good. As the Holidays approach, the country’s largest wine retailer, trots out some magnificent wines for sale, many in large formats. Recently I saw a 3.0L of 2005 Cambria Julia’s Vineyard Pinot Noir ($73), a 3.0L of La Crema Sonoma Coast ($63), and several magnums of Champagne (Tattinger) and sparkling wine (Schramsberg Blanc de Blanc 2000). Costco has its own private label lineup of wines, Kirkland Signature wines, including a tawny port from Portugal, an Oregon Pinot Noir, a French Brut Champagne, a New Zealand Sauvignon Blanc, a singlevineyard Shiraz-Cabernet from Barossa Valley, a Cabernet from Alexander Valley in Sonoma and a Super Tuscan from Italy. 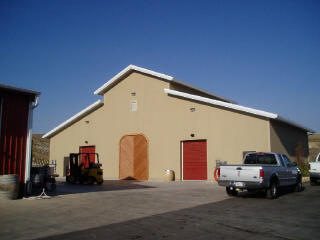 The wines are made by respected vintners in small lots of 2,000 cases and rotated among the warehouses. The wines offer significant savings of as much as 50% over over national brands. I have sampled the Kirkland Signature Oregon Pinot Noir over the last few years and found it to be highly variable in quality, not surprising considering it is a blended wine from several sources. The current 2005 release is about $18, but I think you can do a lot better in that price range with several name brands. The selection of wines varies from store to store so it is a good idea to call ahead to inquire about specific wines. Costco’s strong suit is Champagne. They offer a startling number of prestigious bottlings for prices that are sometimes astonishing. Also, you can buy the Champagnes on the internet at www.costco.com. Examples offered currently include: Krug Grand Cuvee ($129.99), 1995 Dom Perignon Rose ($319.99), 1998 Dom Perignon ($109.99), 1996 Grand Dame ($114.99), and 1999 Veuve Cliquot Rose ($57.99). They have a pretty broad selection of still wines on the website as well. The selection of still Pinot Noir was pretty meager. Costco can only ship to the following states: CA, Ill, NM, Ore, Texas, Wash, and WVa.